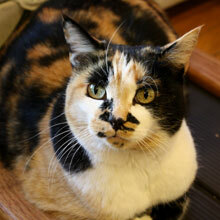 Your cat can enjoy lounging in the sun on a window loft, or snoozing on their own private loft. Each kitty condo is equipped with a loft, a litter box, fresh water and food, and ample space to stretch or climb. We have lots of toys and activities to keep your favorite feline from being bored. If your cat would like to socialize with other cats, introductions will be supervised. You are welcome to bring your cat's favorite toy, binky, or favorite stuffed animal to sleep with. Bring your own cat food we provide cat treats and catnip - with owner's permission only. Please bring your cat in a carrier or on a leash - we will store the carrier. * Cats must have Rabies and Distemper.